Recently I posted about upgrading my old iPhone 3G to a 64GB 4S. One of the things I was mostly looking forward to with the upgrade was the much improved camera and the ability to take video. Last week I spent some time at the Giant’s Causeway in Northern Ireland and I had plenty of opportunity to experiment with both the still and video camera. Although it’ll never replace my DSLR the stills camera managed to take some really respectable shots. By far the biggest issue is the lack of a zoom. The colours are great, the focus is sharp but you can’t use the zoom to frame a shot. You need to move if you want to change what’s in your shot. The video camera is also excellent. The pictures are bright, crisp and clear and it’s very easy to start recording. The small size of the iPhone makes it very easy to move the camera around. Movement is not something I’d had to think about before have previously only used a stills camera, but a static video shot gets boring very quickly. The audio quality is quite poor, at least when you are in a windy location, and as I was on the coast it was nearly always windy. The white noise of the wind masked much of the voice that I was trying to record. Unfortunately I can’t afford a Foley artist so the wind noise remains on the final version. To edit my travelogue there was really only one option, iMovie. As iMovie runs on the iPhone you don’t need to move your video files and get start editing straightaway. Each evening in our hotel room I could review the footage and start the editing process. A touch interface is a natural fit for video editing work, but almost as soon as you start using iMovie you begin to realise the limitations of it. Both rearranging and deleting clips should be possible by drapping them. Instead I found it very hard to make iMovie recognise my dragging, it repeatedly selected the clip instead. Also trimming clips is difficult to do accurately because you cannot drag to frame level accuracy. While dragging the timeline around it also had the annoying habit of scrolling back to the start rather than the small adjustment I was trying to make. The themes included with iMovie are quite nice, but as is the case with the whole app very soon after you start using them you really how limited they are. The two main problem is that when joining clips together you are limited to either a simple jump cut, cross fade or a single theme specific transition. It’s certainly important not to over use transitions, but having a few more options would be nice. You’re also extremely limited when adding text to the video, which is a key part of making a travelogue video. I took some panorama photos using my iPhone as they’re a great way to show a scene that you just can’t capture with an ordinary camera. The first app I tried was Dermandar. This app is incredibly easy to use. You hold the camera vertically and then rotate it and the app captures pictures automatically and then stitches them together. The resulting panorama’s look great, until you try and take them off your phone. Part of the ease of use comes from the fact that it uses the video camera rather than stills camera so it’s much quicker to take the pictures. This is much lower resolution though so the resulting images are disappointing small. The next app I tried was Autostitch panorama. Rather than the pictures being taken automatically you need to line up your photos and press a button to take a picture. When you’ve captured enough click “finish” and the app will stitch them together very quickly, producing great looking full panoramas. It’s not quite as simple to use as Dermandar, but it’s far from difficult and the results are excellent. I’m not quite ready to leave my DSLR permanently at home, but there are certainly occasions when I will think twice about lugging it around with me. 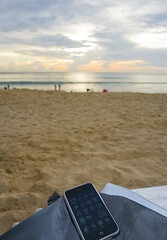 Photo of iPhone at the beach by John_DL. This weekend I joined the hysterical masses and upgraded my increasingly ancient iPhone 3G to a shiny new 64GB iPhone 4S. Except that it was actually a bit of an anticlimax. I went into my local O2 shop at about 10:30am on Saturday morning, the day after the launch, and purchased a phone. No queueing, no raging hoards. I didn’t even have to shove a granny out of the way to get one. However, after handing over my credit card while cringing at the expense it was back home to enjoy the famous Apple unboxing experience. I wish I’d never upgraded my 3G to iOS 4.2. Up until that point it was a great phone. Afterwards it was slow and applications would repeated crash on start up. Did I mention it was slow? It’s hard to express just how much quicker the 4S is compared to my 3G. Often just typing my the passcode would be too quick for the 3G and it would miss one of the numbers forcing me to go back. No danger of this with the 4G though. Application starting, browsing the web, taking photos are all super speedy. Although it’s the same as the iPhone 4 the screen is still incredible. It’s so bright and sharp it’s really a joy to use. It really comes into its own when browsing webpages that are designed for bigger screens. The extra detail really helps you to work out where to zoom in. The camera is also much improved, and I’m sure the addition of video compared to my old 3G will come in useful. I brought iMovie and that seems like an easy way to put together some short videos of my holidays. I haven’t had much of a chance to experiment with this aspect of the phone properly yet, but I can imagine that where carrying equipment is a problem it will replace my DSLR as my primary camera. I’m sure I’ll have more to say on this topic when I’ve been out and about for a while. I don’t intend to make this an in depth review of the phone, there are many hundreds of better places that you could go to for that. One feature that I can’t not talk about is Siri. I struggle to see why, for a non-blind user, you would use it after playing with it for a bit. If you are blind then dictating is clearly a huge help, and the biggest surprise for me is the quality of the voice recognition. I don’t have a strong accent so I suppose that if it didn’t work for me then it wouldn’t work for anyone. Still though, for someone who hasn’t used voice recognition for ten years it’s amazing just how far it has come. There’s lots of talk online about the funny answers that Siri comes up with if you ask it question like “What’s the meaning of life?” It’s certainly to Apple’s credit that they’ve given it so much personality and it’s not just a bland robot. These questions are not a long term use case though. Where Siri really succeeds is as an interface to Wolfram Alpha. Like most people when Wolfram Alpha was launched I played with it for a bit and then forgot about it. The ability to say things like “What’s the distance from the Earth to the Moon?” and have Siri return the correct answer is quite amazing. People are used to typing a few words into Google but Wolfram Alpha needs a bit more than that. A voice interface seems so much more natural and is probably Siri’s killer application. Unfortunately as I’m in the UK Siri doesn’t do mapping or business search for me. Roll on 2012 when that is supposed to be added. It’s early days yet, but I’ve fallen in love with my phone all over again. 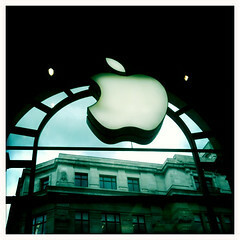 Photo of Apple Store – London by nabekor. 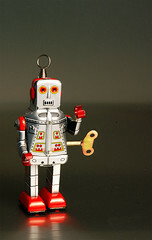 Photo of Robots only eat old people by Mark Strozier. It was with some trepidation that I listened in to this Monday’s Apple developer event, the WWDC keynote address. I have 16GB iPhone 3G, a current top-of-the-range model. With all speculation before the event it was clear that Apple were going to release a new model. But what were they going to include? Were they going to include the kitchen sink as some had been suggesting? Fortunately, as the change in name would suggest, the new iPhone 3GS is an evolution rather than a revolution. Apple claim it has twice the magic which should equate to much faster application loading and probably better games too. In reality it’ll mean twice the cpu speed or twice the memory, or more likely both. It appears that the biggest change is that the iPhone 3GS contains a new graphics chick which gives it seven times the graphics throughput, Seven times! The extra disk space that comes with a 32GB 3GS is nice, but is unlikely to be a reason to pay the extra for a 3GS. The same with voice dialling. The new phone does contain a compress, which will certainly make using the mapping application easier, and will allow for some really nice apps. When Google change Google Earth to us the compress it’ll be really nice to use. I’m not going to pay the extra to upgrade before my contract is up, but I’ll certainly be a bit jealous of those with a new 3GS. On Friday I download a fun little puzzle game for my iPhone, FlightControl. The premise of the game is that you’re running air traffic approach control for a small airport and you need to arrange for the two types of passenger jets, light aircraft and helicopters to land in the appropriate places without crashing into each other. A simple concept with even simpler controls. You tap on the plane you want to direct and then drag the plane to the runway. It will then follow the path you dragged out. It’s incredibly easy to use and really lets you focus on the goal of stopping those planes from crashing. The graphics and sounds are excellent. The game has a great cartoon feel and although the menu and ui are minimal it has a very consistent look that clearly didn’t happen by accident. The map and airport look good and there are plans to add more airports to the game which I hope will be done to a similarly high standard. The game starts off very easy to let you get the feel for the controls but the difficulty level ramps up pretty quickly and you’ll soon have to deal with five or more planes at once. When you’ve got two planes flying at different speeds trying to land on the same runway your brain will start to melt, but in a good way. The game features online leaderboards which is a nice touch, but like with most online stats the leaders are way out of most users reach. The current all-time top score is almost 15,000. My best is 53. My only criticisms are that the airport is perhaps a little large which means you don’t have much room to sort your planes into stacks as you wait for them to land. The game also has an annoying habit of letting new planes enter when an existing plane is right by the edge so they crash before you can do anything. A warning icon does appear to give you time to move a plane out of the way, but it’s frustrating to lose a game in what seems like such an unfair manner. Finally I think the game could be improved by putting ticks on the planes paths so you see more easily when they well get to a certain point on the map. A small marker every five seconds of flying time would be very useful. The game is a great pick-up-and-play title, and you won’t be able to play it just the once. With the game currently selling for a greatly reduced price it should be on every casual gamer’s iPhone. ID Software have taken time out from letting you play Quake 3 in your browser to release a port of the granddaddy of all first person shooters – Wolfenstein 3d. The iPhone is really beginning to show itself as an excellent gaming platform, and despite its age Wolfenstein really looks at home on the phone. The graphics are, quite frankly, rubbish. However, they’re exactly as they were when the game was released in 1992 which is exactly the point. The sound has faired much better and sounds great. The voices of the German soldiers still send shivers up your spine. It’s an extremely faithful port of the game, and the addition of an automatic save feature means it really works as a pick up and play game. It’s very easy to dip in and out of taking one level at a time. The controls have naturally been revamped for the iPhone’s unique control system. You steer by moving your left finger over up/down/left/right arrows and fire by tapping your right finger on a button. This works really well and it is very easy to pick up and to start running around the Nazi prison that you find yourself in. The controls do rather feel like driving a fork lift truck. You regularly find your self reversing backwards around a corner, which is not how a person would move, but it’s easy to forgive and hard to see how else it could be done. The game might seem a little expensive at £2.99 but you get all six episodes of the game which will last you many hours. It’s available in the App Store now, and for such an old game still shows its class amongst the other games available on the iPhone. If you’re interesting in the process of making the port then John Carmack has written a detailed post describing it. Yesterday, as was splashed all over the web, Apple announced the iPhone OS 3.0. The key features in my view that were announced are cut and paste, push services and the possibility of turn by turn navigation. I was a bit skeptical over being able to copy and paste. I imagined that it would only be useful if your were using the iPhone for business, which I don’t. Apple’s implementation seems to be highly impressive though, and I’m suitably impressed. Rather than just being limited to copying text between the inbuilt application it appears that you will be able to copy HTML, images and more between both the inbuilt applications and more. If you want to send more than one photo in an email just copy it from the photo app and paste it straight into an email. Sweet. Recently my iPhone has been suffering from a strange problem where the battery goes from full to empty in just a few hours and feels warm to the touch. I suspect that the problem maybe due to the mail app so it is excellent news that the much delayed push services will be coming this summer. Rather than applications needing to poll for information developers can ‘push’ updates out to your phone automatically. This has the dual benefit of saving battery power and giving some applications a fake running in the background mode. The facebook app could keep you logged into facebook chat all the time and alert you whenever someone sends you a message. The same is true for email and other chat applications. Other applications include a landscape keyboard, greatly improve SMS support and MMS so you can text photos around. Unfortunately there is no date for release yet, but it will be released by this summer. It’s a free update for iPhone users but iPod touch uses will need to shell out a small amount of cash to get it. Darkslide is an excellent iPhone app which makes it easy to use Flickr on the move. The iPhone is a perfect partner for Flickr. Constant internet access, GPS and serviceable camera mean that you can snap away and have your photos on the internet and geotagged in seconds. Flickr does have a mobile site and provides it user with an email address where you can email photos. On an out of the box iPhone it’s possible to get a decent Flickr experience. Emailing your photos has several disadvantages: the quality is reduced, and the photo is stripped of geotag information. Darkslide lets you easily take and upload photos at full resolution. You can also tag, comment and browse through both your photos and others. You can also access the Flickr’s interesting feed if you’re in need of inspiration. It’s available both with and without ads, but apart from that the two versions are identical. It’s simple, slick and just works. If you’re a Flickr user with a iPhone then it’s a must have. Andrew Wilkinson Create a free website or blog at WordPress.com.